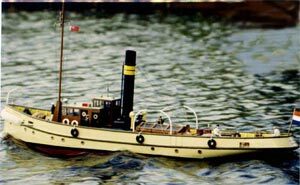 The first of a new range of model ships to be added to the DEANS range for Steam power. The S.S. CHRISTIAAN BRUNINGS is a museum steam ship preserved in running order at the VEREENIGING NEDERLANDSCH HISTORISCH SCHEEPVAARTMUSUEM where she is kept in full working order providing trips to the public during summer season. She was constructed of steel in 1900 as tender and pilot boat to the Dutch Icebreakers and to this end she is fitted as a coastal Icebreaker in her own right. This kit of a preserved steam ship is the first of a new range of model designed to be powered by a STEAM ENGINE or standard electric motor, instructions for both units are included. Plated glassfibre hull; Detailed glassfibre superstructure. Computer generated printed parts. Full set of metal fittings. FULL SIZE PLAN and instructions. Full set of vacformings, propshaft, prop and tiller.